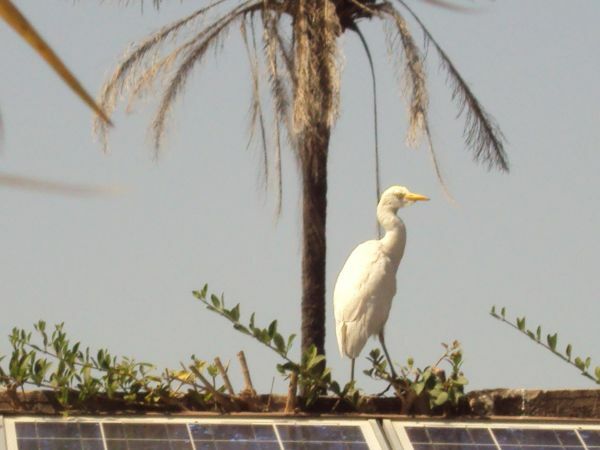 Solar-powered accommodation in a natural area 2 km from the sea on Gambia’s unspoilt south coast. Stay in a large, airy octagonal lodge with your own large private sun terrace. Buffet breakfast, daytime drinks and snacks and a set 3-course evening menu. Plunge pool , hammocks, lovely gardens. Airport-collection service. The maximum rating score we can award in each section is 5, and the minimum 1. When a criterion is fully met in our view we award 5 ecoclub suns, when it is nearly met 4 suns, when it is partly met 3 suns, when it is not at all met but effort is being made to meet it 2 suns, when we feel that it is not at all met and no effort is being made to meet the specific criterion, 1 sun and when we feel that the the specific criterion is being directly violated by the operation 0 suns. You may add a comment with improvement suggestions to the Lodge at the bottom of the page. For detailed information on the free ECOCLUB.com Rating System please see here. Musa Fatty and Heather Roberts. 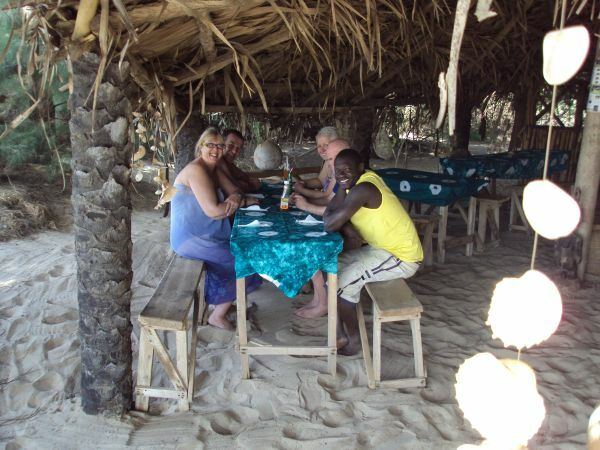 We have owned and managed the lodges jointly since opening in 2009. 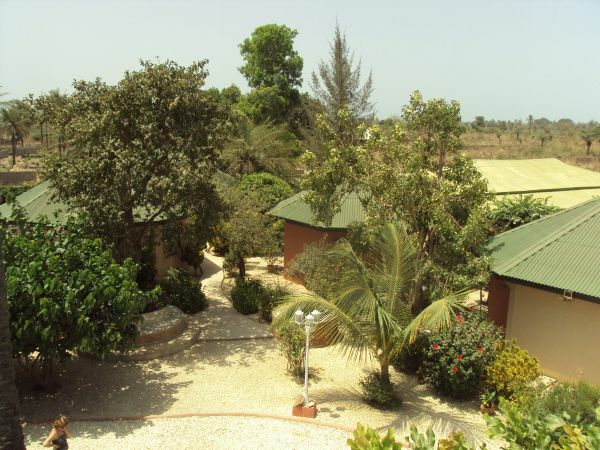 We have lived in The Gambia together since 2007, married in 2008, and since opening, stay for 8 months of every year (the season for guests) Our home adjoins the business land. We take all management decisions jointly. We hold a staff meeting at the start of every season and also encourage consultation with staff concerning catering and grounds. Guests and their friends, staff and their families are all welcome. We have an end of season pool party each year for staff, their children, and extended families. Our new tree sanctuary will also be open to the public once completed. 1f: Open house for extended family and staff children...feasting before enjoying the pool at our end-of season party. We decided jointly, as we wanted to do something positive for the local area, become more involved with our community and protect the adjoining land from tree cutting. 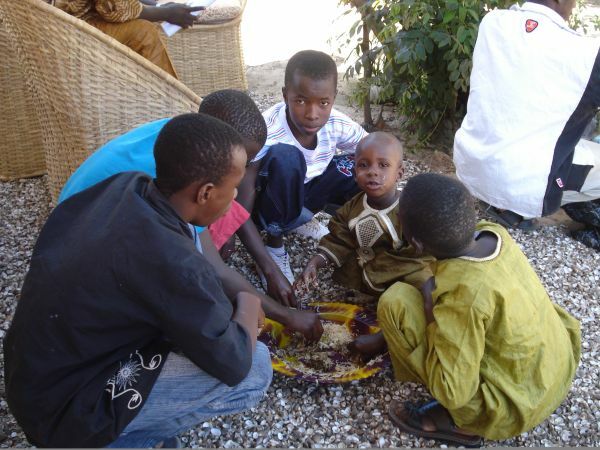 As the sole employers in the hamlet of Farakunku we have enjoyed full integration with local people. 1h. Which is the nearest local community (village or town) and how far is it from the lodge (in Km)? We are in the midst of Farakunku hamlet and 1km from the bigger village of Tujereng. 1i. Did the (nearest) local community participate in the decision-making process concerning the founding and creation of this Lodge and how? 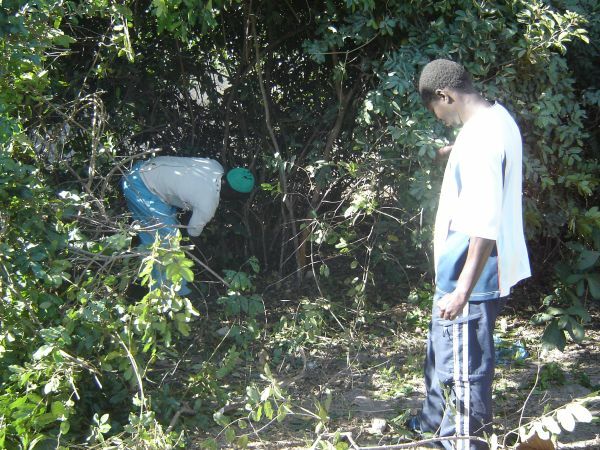 We were some of the first to buy land in Farakunku and move to this previously undeveloped bush area. The village alkalo (mayor) supervised the land purchase and when we opened we held a religious blessing with all the local elders and officials from Tujereng. 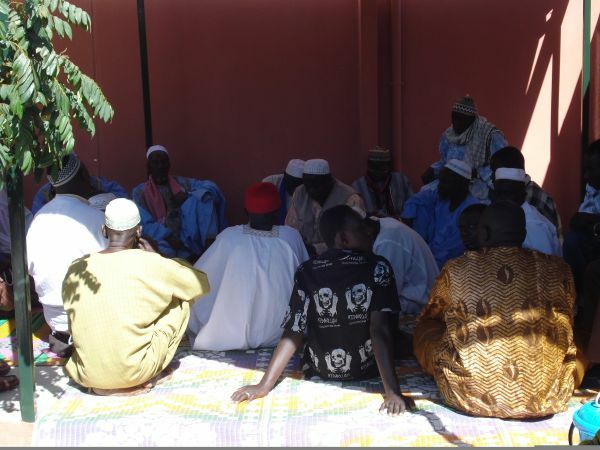 1i: Our village Alkalo, the local Imam, the elders of Tujereng and our staff joined together to officially bless and pray for the success of our business before opening in 2009. They are seated under the solar panel canopy. 1j. Does the (nearest) local community participate in the running of the lodge and how? 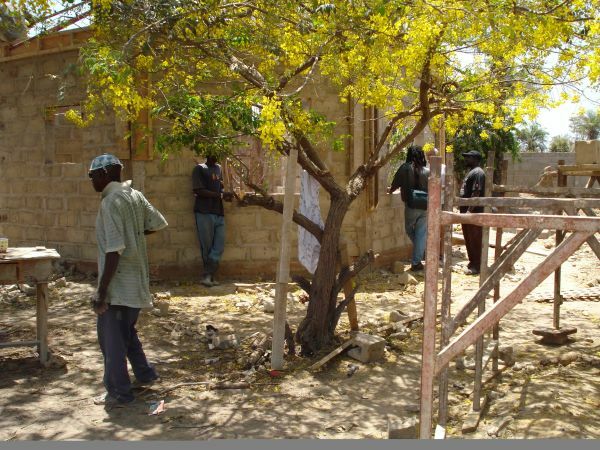 The nearest local dwellers became part of the building team and we later employed our chefs, night security, gardeners, laundry lady and cleaner from within walking distance of the lodges. The local Women’s market garden supplies our vegetables. 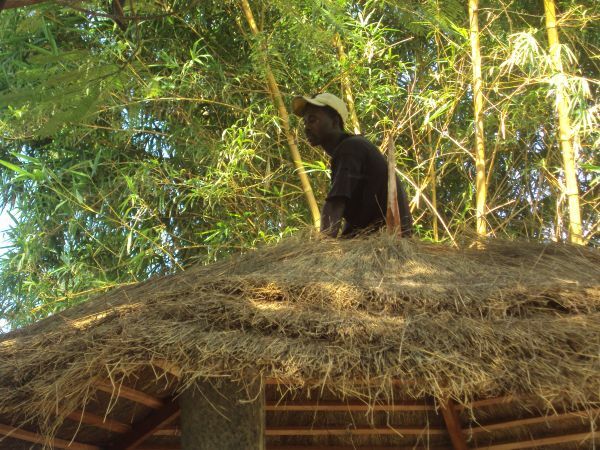 The local basket weaver comes every season to repair/replace palm leaf furniture. 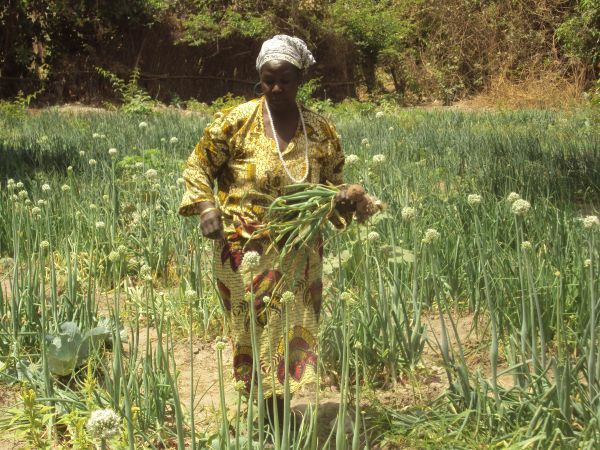 1j1: Our friendly gardener Fatou who grows and sells onions and other crops for us, at the Women's co-operative garden on the edge of Tujereng, just down the track from us. 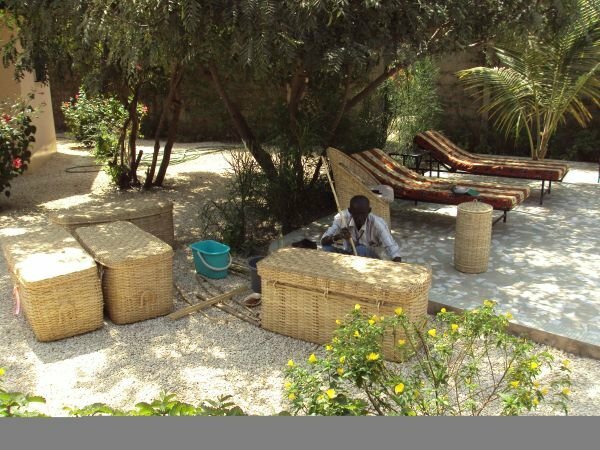 1j2: Baba, our local basket maker, comes to the lodges every season to repair our hampers, chairs, coffee tables and baskets in situ. He made all the woven furniture for us originally. We discovered him working on the beach trying to make a living selling small items to tourists. 1k. Anything else you would like to mention in this section? As an ex- primary school teacher, I have been asked to help next season at the local Women’s Skill Centre (Fandema) in Batokunku (a neighbouring hamlet) I will read stories and act as consultant in setting up early years classrooms as their centre develops. I have already helped at art days at another local school in the past. 4 (four) individual detached lodges, en-suite. 2b: one of the 4 lodges showing the 4-poster bed withmosquito drapes. This was made by a local carpenter.You can also see Baba's woven hampers, chairs and table.All rooms are furnished in the same way. 2d. What is the total area of the Lodge including rooms and common areas (in sq. metres)? 4,720 square metres (this is as in 2c, less our own home which takes up a footprint of 200 square metres within the grounds, and 80 square metres for stores and staff quarters) Everywhere else is used and accessed freely by guests. 40 square metres for the 2 staff accommodations. 2j. What were the total profits in 2011 and in 2012? 2k. How are profits distributed, and who decides about it? We have used up all the 2012 profit by replacing solar water heaters and upgrading to sealed solar batteries. With the remainder, we purchased an adjoining parcel of land which we are now developing as a tree and bird sanctuary. 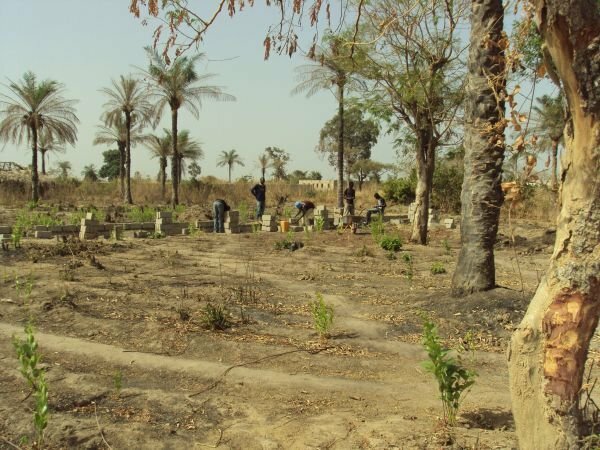 This is an on-going project with rare indigenous trees being collected and planted as a buffer zone between us and a nearby projected building estate where many trees are due to be cut. 2k: Our newly purchased land at the beginning of March 2012 where we saved the few remaining trees and constructed a wall to keep it secure before planting many new trees for our tree sanctuary project. 2l. Are there any national and local taxes to be paid or are you exempt? We pay an annual business tax (based on having 4 lodges), an annual tourist tax, and annual local tax on the land and property. 2m. What was the total amount of taxes paid in 2011 and in 2012? 2n. What percentage of consumables are locally sourced, how many are nationally sourced, and how many are imported? 100% locally sourced fruit and vegetables, 90% nationally sourced consumables. The only imported goods are wine and coffee. We buy locally produced honey and I make all the jams and chutneys myself. 2o. Do you cultivate food for the guests? We have our own lemon, banana and mango trees and grow some herbs. My chef who lives next door grows salad for us. 2p. Do you have any agreements with local producers? We provide seeds for the Tujereng Women’s cooperative and buy our fresh vegetables from them when in season. We purchase everything else from the local market where I personally shop every 2 days. Local villagers often come to the door selling their surplus fruit and vegetables which we always like to purchase. 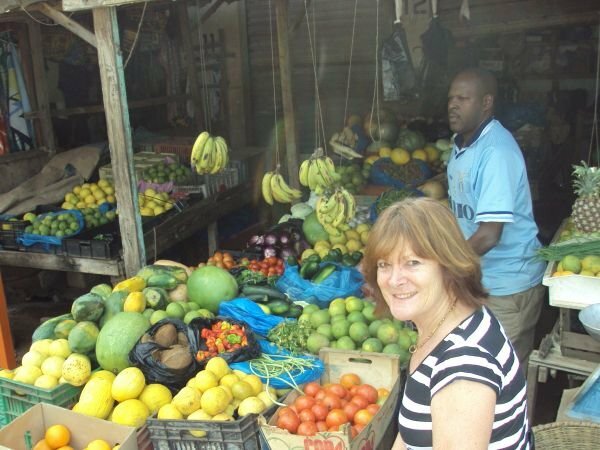 2p: Here I am at the local fruit and veg market (where Buba always gives me a seat!) while he completes my order. 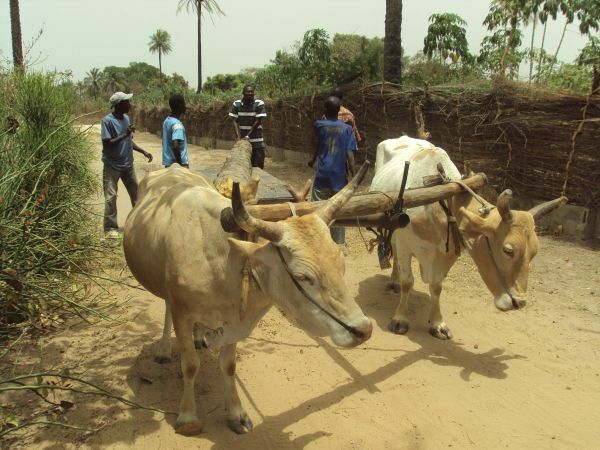 Much of it comes from larger producers (up-river) in The Gambia. Other produce, such as salads, I buy more locally. 2q. Have ever you received any funding, state, national, private or international and for what purposes? No, we are a small, and relatively new concern doing what we can ourselves with our own funds. 2r. What is the minimum (low season) double room rate (including breakfast) per room per night? £42 on bed and breakfast basis for 2 people. 2s. What is the maximum (high season) double room rate (including breakfast) per room per night? £52 on bed and breakfast basis for 2 people. Our ‘high season’ is from November to mid March and is the most popular time for bird watchers. 2t. Are you planning to sell the property within the foreseeable future, and if so why? No we have no plans to sell in the foreseeable future. We have made this our home. 2u. Is the Property open all year round? If not please provide relevant dates. We close during the rainy season from early June to the end of October, as access on our track, plus the humidity, heavy rain storms, lack of sun for our solar equipment and lack of charter flights to bring guests, all conspire to make it impossible to carry out our business in the way we would wish. 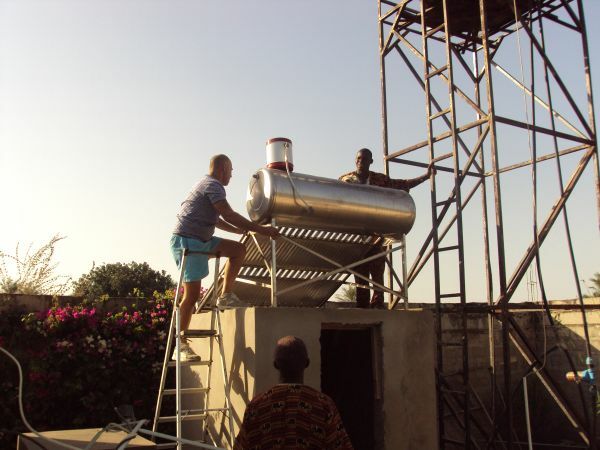 2u: One of two very efficient solar water heaters that were installed in 2011 to replace and upgrade the originals. 2v. Anything else you would like to mention in this section? Our grounds staff remain on site during the rainy season to maintain the property and deal with any emergencies. We are in contact with them weekly from UK. In 2012 they had to tell us of a wall collapsing on top of and destroying our new solar water heater during a violent wind and rain storm. We organised the replacement and everything was ready for the new season in time. We were already married and living in Farakunku and were alarmed at the number of trees being cut for firewood in the area. 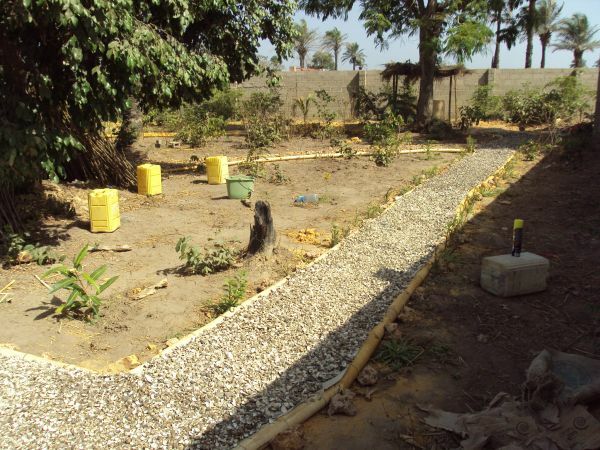 We had chosen to live in Gambia back in 2006 to enjoy the natural vegetation and quiet life in a small hamlet. It was surrounded by natural bush at that time. We therefore decided to purchase the land adjoining us to save and add trees and to create a small eco business. 3a: Moses is assisting the land clearance workers and deciding on what to keep and which scrub to clear before marking out our site. We selected a resident British expat civil engineer/building contractor to design and project-manage the building of the lodges and restaurant using 100% Gambian building team, masons, carpenters, plumbers, tillers etc. We were able to contribute to the decision making (living just next door) Solar technicians were brought in at an early stage. We built between existing indigenous trees to keep a natural environment. 3b: Our building is in progress. You can see that we decided to build only 4 lodges (rather than a possible 6) so that the remaining trees would not be disturbed. This is one of the several gorgeous African laburnum (sin jango) in full flower. Outside decoration every 2 years; inside decoration every 3 years; solar equipment checked every 2 months; grounds cared for every day; small plunge pool serviced every season, aerated by solar pump daily, treated once a week with minimal chemical (20g) Bantabas (sun-shelters) are re-thatched by local villagers using grasses cut from the bush every 2 years. 3c: Musa , who lives along our track, has thatched all our bantabas and comes, when needed, to re-thatch using local grasses from the bush. No need for this in Gambia. 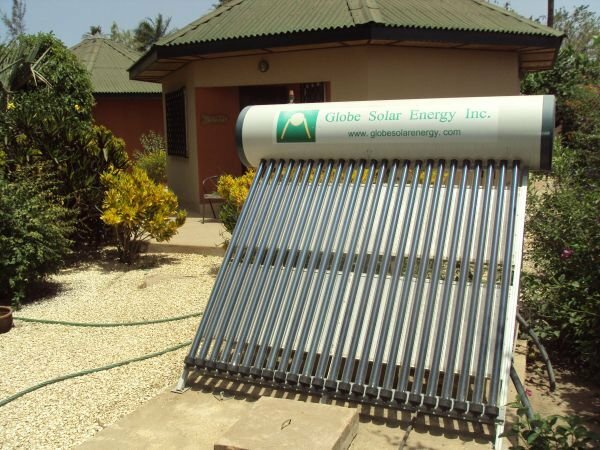 Solar water heaters are situated in the grounds and provide excellent ample and reliable hot water for guests’ showers and for washing up in the restaurant. Lodges designed as octagons with louvre windows on each wall to create perfect cross ventilation. Additional ceiling fans operate from our fully integrated solar power system. Every lodge has trees providing natural shade. Rooms are cleaned daily using water with added eco-friendly liquid detergent. Linen and towels are washed by our neighbouring laundry lady, using locally made soap. We have our own deep well and water is pumped by submersible solar pump to 2 storage tanks on the water tower. This water is safe for drinking. It is used for all purposes (washing, pool, garden watering, toilet flushing etc.) Waste water drains into our on-site soak-away. We use a mixture of bottled gas in the main kitchen (containers recycled each time) and re-cycled ground-nut husk briquettes as fuel for barbeque grills, and a solar cooker. 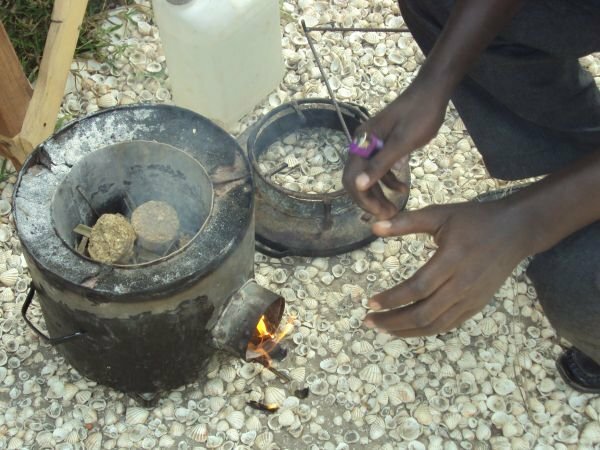 3i1: This is the groundnut briquette cooker in use at our lodges and being demonstrated as an alternative to charcoal,use of which threatens the precious trees in Gambia. We promote this recycled fuel for staff use as well as for guest barbeques. 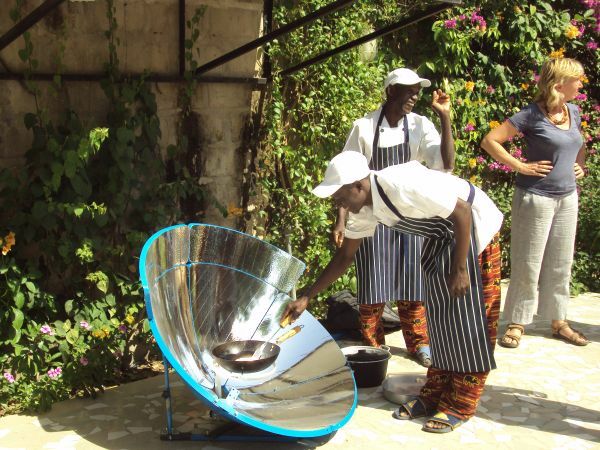 3i2: Here our chefs are cooking on the new solar oven and were amazed, at first, that it heats food so quickly. It is part of our mission to use alternative energy sources. All compostable waste is emptied into our own garden compost pit and later re-used on the garden; plastic and glass bottles are redistributed to local families who use them for storage; there is no organised recycling in the area so we have to crush and bury the remainder in our own dedicated covered pit in the far corner of our own large grounds. There is no real mosquito problem here as we benefit from moving sea breezes which reach us from the coast. 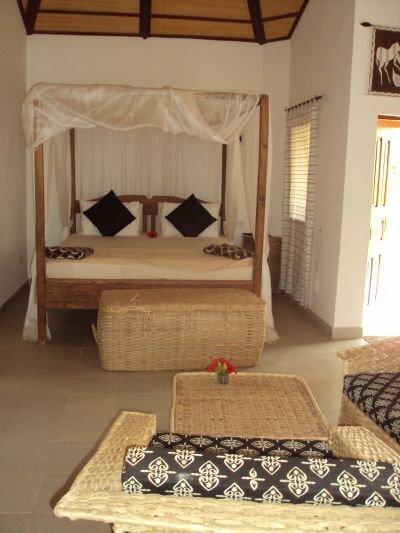 Nevertheless we have mosquito netting on every bed and windows are also netted for the reassurance of our guests. Termites have to be eliminated with chemical when necessary. We try to use local transport for deliveries where possible e.g. donkey or oxen cart to bring heavy goods, and/or local bush taxis. Apart from the bottled gas for cooking, everything (including fridge and freezer) is solar powered from our integrated system of 23 solar panels, solar battery units and inverters. We produce silent solar energy and don’t even have a back- up generator. Guests come to us for the peaceful surroundings. Trees add to the sound proofing from any outside noise although there is very little, as locals do not own vehicles and we have only earth tracks passing our grounds. 3n. Name, population and distance of nearest settlement (in km or miles)? Yes, the public bush taxi stops at the main coast road junction with our track and then it’s a 10-15 walk (3 minute bike ride) to reach the lodges. Local hire taxis will deliver guests to the door however. 3p. Is the nearest settlement accessible by public transport (such as bus, train, boat)? If yes, please provide instructions from nearest International airport, or nearest major city. Yes, Tujereng is accessible by bush taxi from Tanje our nearest large village (which is 6km north) Local hire taxis take passengers from the airport to Tujereng or direct to our lodge. From the airport and the North: Leaving the airport car park, turn left onto the dual-carriageway up to the main Brikama/Banjul road T-junction. Turn left onto dual carriage-way then first right filter (at traffic lights). Follow this, taking no other turnings, until reaching the one and only roundabout. Take the 3rd exit southward, passing through Brufut, Ghanatown, Tanje and turn left into Tujereng. If coming direct to the lodge, continue beyond the Tujereng turning and follow road sign to Farakunku Lodges. An overview of the lodges to show how we have introduced many more trees and vegetation to enhance habitats for wildlife and the enjoyment of guests. The buildings blend in unobtrusively by using green roofing materials and by painting walls in earth colours. Louvre glass window panels for maximum natural ventilation, Malaina wood from sustainable forest, metal roof joists from local welder, ‘Onduline’ roofing made from recycled materials which deflects heat and aids soundproofing, cement blocks (hand made in situ), rafters and frames in redwood (anti termite). 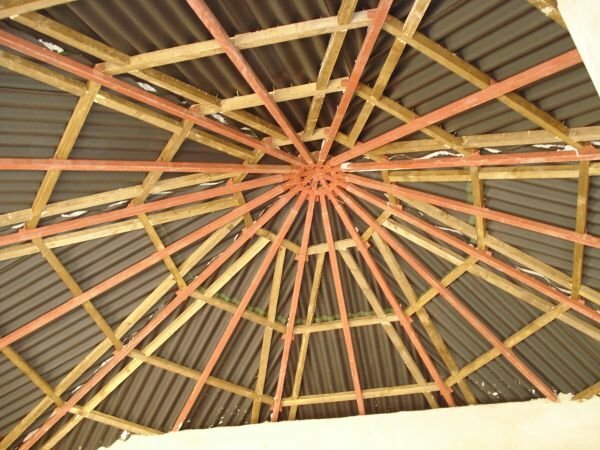 Ceilings are constructed with locally welded metal joists and locally grown sustainable wood (Malaina) and termite resistant redwood. Pathways and drives are topped with the waste product cockle shells from nearby cockle harvesters. 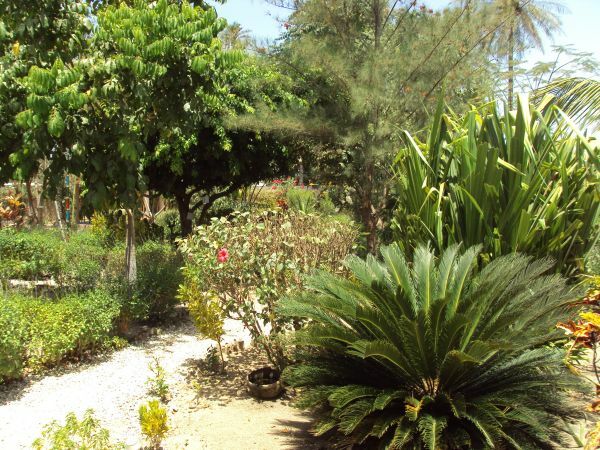 Gardens are watered twice daily by 2 full time gardeners using our own well water. Prunings are composted and many are propagated for planting within the grounds. Mulch is taken from our compost pit. Hundreds of flowering shrubs and many trees have been planted to attract butterflies and birds. The cockleshell paths wend through the grounds and lead to different quiet seating areas. 3u: Do you organise or promote tours involving hunting or sport-fishing? 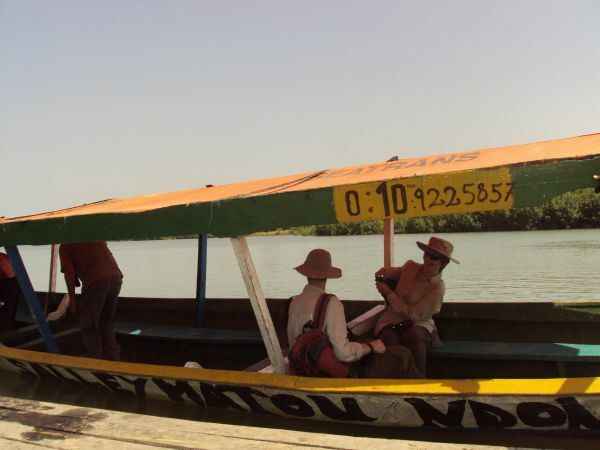 We have taken guests to the River Gambia on a covered boat for some leisurely fishing as part of a day trip combined with bird watching. Also pirogue trips on the River Allehein We have also been asked by a few guests to arrange a half day of rod and line sea fishing. Their catch was barbequed for staff and guests. 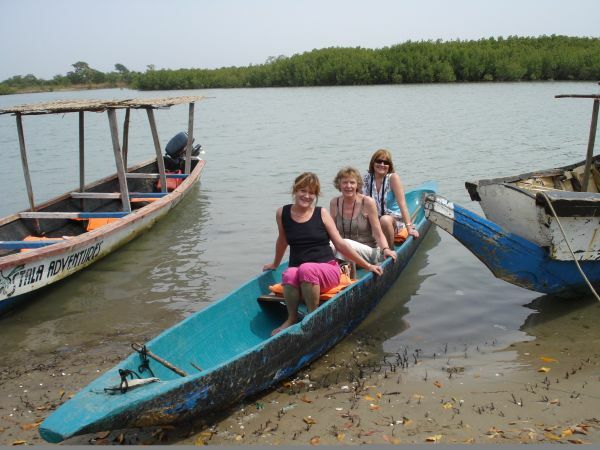 I am with 2 guests in a wooden pirogue for a trip on the Allehein river to view the mangroves at close quarters. 3u2: This is the covered boat we use on one of our popular organised day trips for our bird watching guests on The River Allehein.They will have spent the morning with a birdringer, taken a guided walk from the birding observatory before then travelling with a guide on the boat and later eating lunch at a small riverside lodge. No we don’t measure consumption. We cook one set lunch/simple snack and one set 3 course evening meal for the exact number of guests so there is very little waste. 3w. Anything else you would like to mention in this section? We have bikes for hire and have personally way-marked several self guiding walks/bike rides along tracks, from the lodges for guests to follow with written instructions. These take them to the local bush, village, agricultural area, local school, cashew forest, local beach and remote compounds. 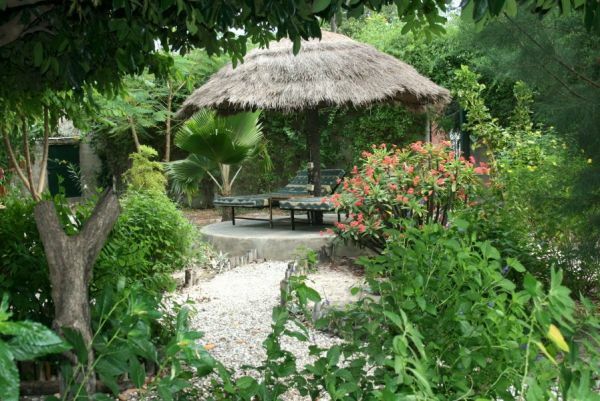 Our 1800 sq m tree/bird sanctuary is less than 1 minute walk away. It has been designed and developed with the help of an Abuko Forest warden and with purchases from the Ministry of Agriculture tree nursery. Tree information will be displayed for visitors. 3w: Our developing new tree sanctuary, one year on since the land was purchased. We have landscaped and planted with many specimen trees.We have allowed the indigenous trees to regrow (since, sadly, people had cut them for firewood)New paths are topped with waste product cockle shells from the cockle harvesters and are edged with bamboo cut from our prolific growth in our own gardens. New bamboo grows at the rate of a metre a week! Yes. We also have business insurance in case of accidents/injury at work. Two weeks per year for the full time staff. There is no minimum wage in The Gambia but we pay above the wage that many workers in the tourist sector receive in the big hotels, as well as providing 3 of them with accommodation and all of them with daily meals. Our season lasts for 7 months between Early November and early May.4 staff members are employed all year on full pay to maintain the lodges and grounds. 2 chefs return to their peanut and cassava farming for the 5 months we are closed in the rainy season and receive a half pay salary as a retainer. Our driver has his own taxi business and the laundry lady takes in local washing while we are away. No we don’t employ immigrants. All our staff (other than one chef,) have been trained ‘on the job’ and they have been with us since opening. They take a pride in their work and even wear their uniform when off duty in the village! 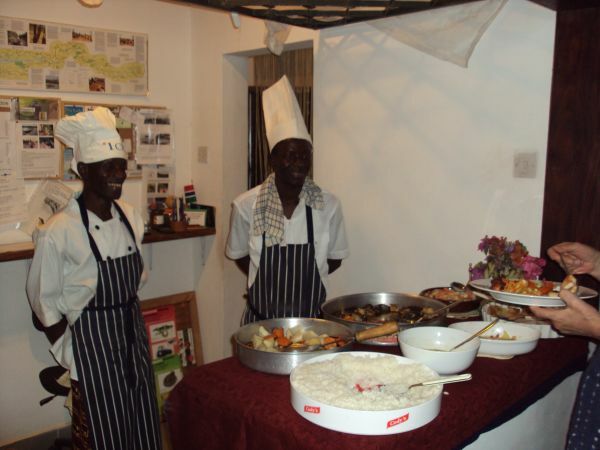 4j: Our two chefs serving at our New Year's Eve buffet ...Lamin (on the left) has been our chef since opening and he has helped to train Alkali who joined us 2 years ago straight from catering college. No we don’t have volunteers. No, not as such, although we have only 2 low steps to negotiate anywhere on the property, have full time staff for assistance with walking and spacious lodges are all on one level with wide doorways. We welcome back several elderly guests with walking difficulties who return each year. In our rural area the local population don’t experience anything other than a positive impact from our guests, who are advised not to give out sweets or money to children in order to discourage begging, but instead, to donate pens etc to the local school. Guests are asked to respect the local dress code by wearing modest cover up. All our neighbouring families understand how to greet but not pester guests when they are out walking. We distribute school materials that guests have donated. We promote the idea of sponsorship for school children on our website and manage the selection of needy families for guests to help. Many of our local families now have children who are able to attend school and have their education paid for by our guests. We are also personally committed to helping 2 local children for whom we are ‘godparents’. 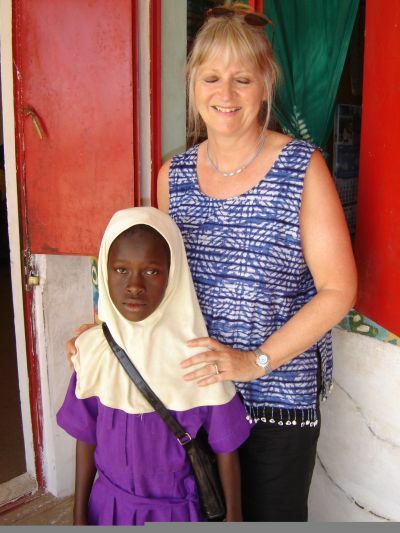 4o: One of our guests at school with the child she had chosen to sponsor throughout her education. Our policy is to treat and respect everyone equally. On an informal basis, Moses is sometimes asked to mediate between two factions during local family feuds. His views are respected in the local area. 4s: We are with our staff in the grounds. Only missing, are our driver Modou and the laundry lady Mariama who were both busy at work at the time. Our restriction is a minimum 2 night stay in order to prevent couples wanting to use a room for just a few hours! We are the unofficial local emergency service for visits to hospital/midwife as we are the only vehicle owners in the hamlet. 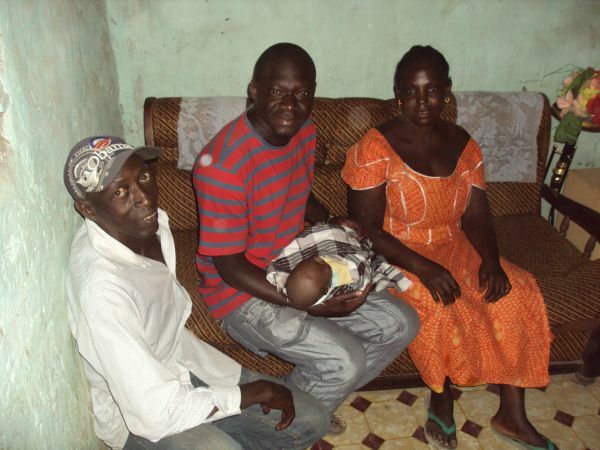 Moses has several times been woken during the night to take neighbouring women in labour to have their baby. Two of the babies were named after us...one of each. We also provide free first aid to locals. 4u: Moses is in the home of our night watchman with their new baby 'Heather' in 2012 after the naming ceremony held at their home. 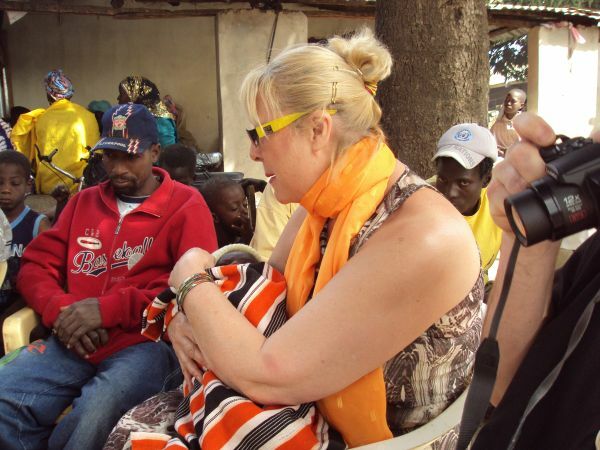 We are the 'godparents' of the baby and will be sponsoring her through school when she is old enough. Yes, in many ways. The self-guided walks encourage guests to venture beyond the gates into the local community; we have arranged football matches with local teams for guests; we take guests to local weddings, naming ceremonies, music and dance festivals. Guests like to be taken to our nearby Women’s garden, chef’s plot and the fruit market to see where their food comes from. Special festival days like Tobaski are celebrated with locals coming into the property for gifts/treats from us. 5b: Here is one of our guests at a naming ceremony held in a neighbouring compound. She was very keen to go and was welcomed by the parents who wanted her to hold the baby. 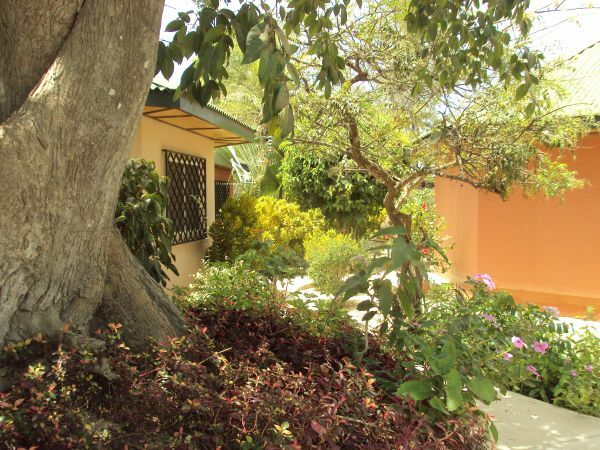 There is a welcome information folder in each room detailing all our local trips, recommendation to visit the cultural museum and local fish smoking centre, advice on the area and how to interact, no-smoking policy, Gambian lunch menu, summary about ourselves and the property. 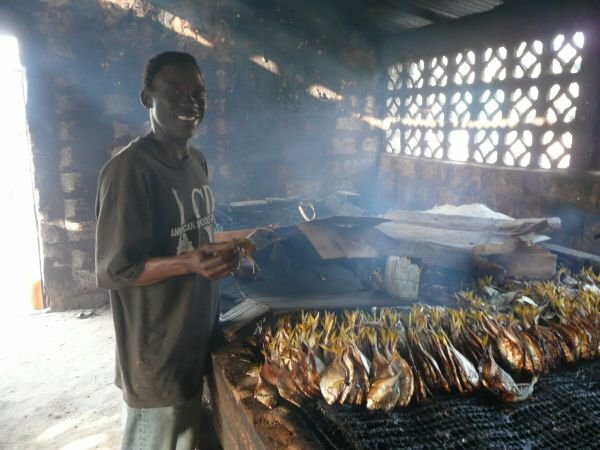 5c: In the fish -smoking sheds at Tanje...one of the recommended trips that many of our guests enjoy. We include a visit to the cultural museum in the village and watching the fishing boats arrive at the end of the day. We have our own guide who explains everything. Self guided walks, guided night walks for owl and nightjar spotting, bike hire, pool bathing, bird watching in the grounds, peaceful enjoyment of the tree sanctuary. Local cultural musicians come to entertain guests on some evenings. We provide free transport to and from the beach and to eat at the locally-owned fish restaurant there. 5d: Guests are taken by free transport (if they don't want to walk or cycle there) to the local beach and we always recommend that they eat 'Catch of the Day' at the beach shack restaurant. This is locally owned and run by some lovely Gambian villagers. We offer guided bird watching with our own qualified bird guides, escorted excursions by car to places of interest such as the reptile conservation centre, a honey farm, ancient forest and local craft markets. Every Sunday there is African beach wrestling at Sanyang. 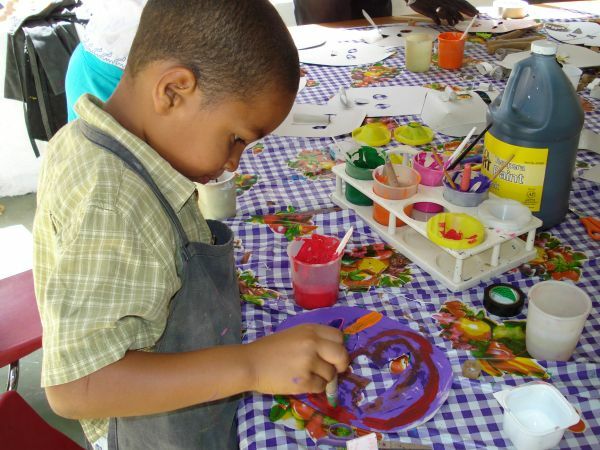 Art workshops at the local Women’s skills centre for batik/ tie and dye. Jewellery making at nearby Mama Africa Women’s museum and art gallery/workshop. River and sea fishing on request, Kartong bird observatory with personal bird guide. 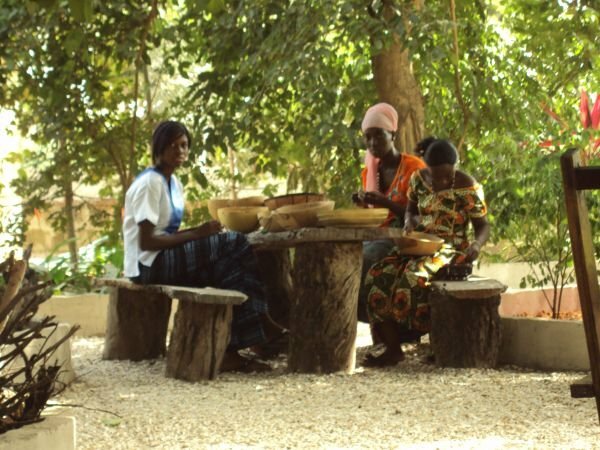 5e1: Ladies are making necklaces in the gardens of a local craft centre (Mama Africa) . We have an arrangement to take guests there for art and craft tuition at their various day workshops. 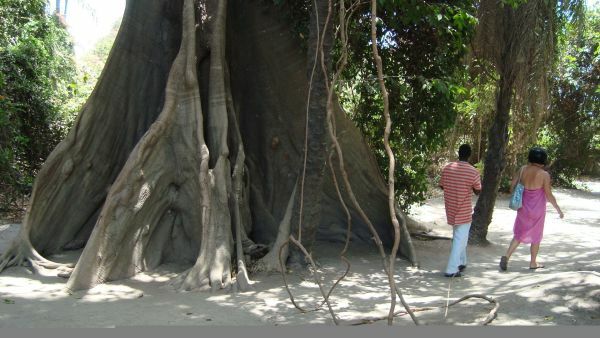 5e2: Moses is escorting a guest through the ancient forest in Bakau where there is a sacred Crocodile pool. This is another of our recommended trips. 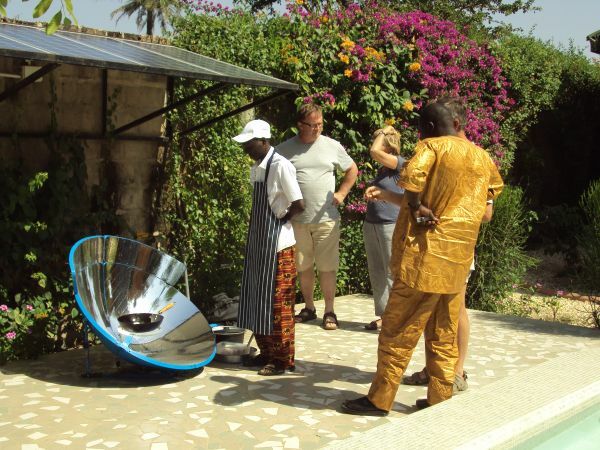 We hosted a solar cooker demonstration for a Belgian company and invited locals to see how to cook from the sun. We also held a small demonstration for locals to explain how to replace charcoal with fuel briquettes made from compressed groundnut husks available purchased from GreenTech Gambia. 5f: The solar cooker is being demonstrated to the village Alkalo (mayor) and some other guests, who were all curious to know how it worked and whether other local kitchens might adopt this method in future. None...other than an end of season pool party for our staff children and extended family. 5g: Here are the children enjoying the pool at the end of our season. This is a much anticipated event for them all. We have a feast first and, after the swimming, we all go to the local beach for a barbeque as a way of thanking staff and family alike for their support. Our staff all come from the immediate locality (within walking distance) Laundry is done in the neighbouring compound, fruit and vegetables are grown for us in the community gardens. Surplus produce is often brought for us to buy. 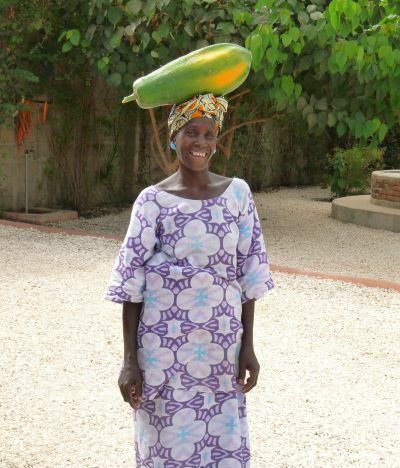 5i: Mariama (our laundry lady) is bringing a papaya from her garden to sell to us for use in the restaurant. We promote the excellent bird watching in our area at the National Bird Fair in Rutland every year (a 3-day event) while we are in the UK. 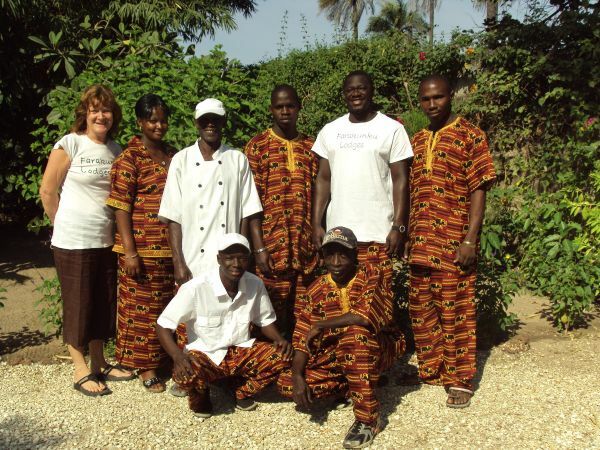 Our guides are all Gambians who are fully trained and qualified and have years of experience. 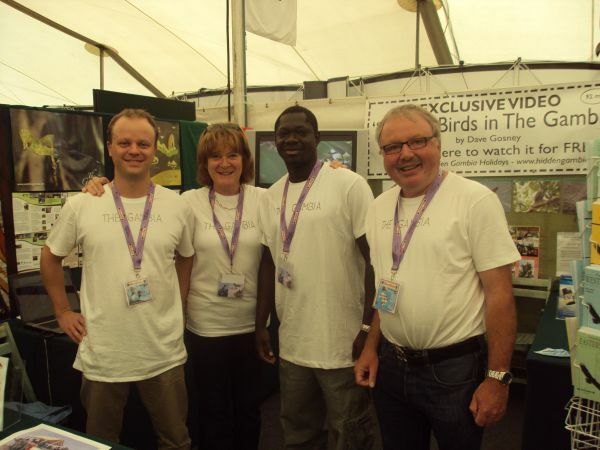 5j: Every year, we spend 3 days at the Rutland Water Bird Fair promoting birding in The Gambia. 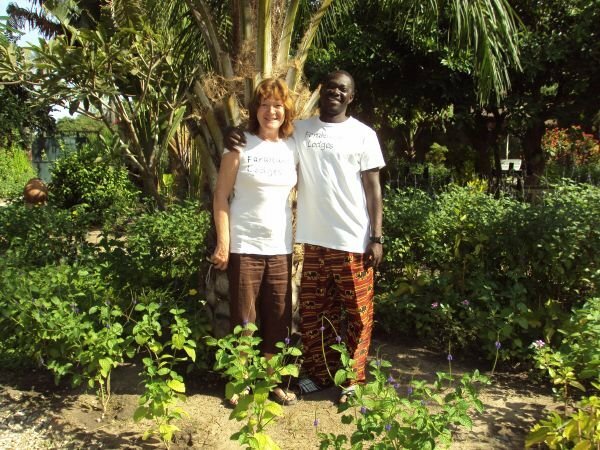 We work with other eco-lodge owners to bring discerning eco- tourists to The Gambia.